A kind of citizen energy consciousness has rooted itself in America. We now know too much to make fun of alternative energy as something for latter-day hippies living in yurts. This latest energy awakening really started in the late 1990s, when electricity supplies faltered during high-use summer periods. Then in late 2004 the price of crude oil started to rise; and since 2007 it has shot into ranges previously unimaginable. The shock of $40-per-barrel of oil in 2004 became $60, $100, and, by July 2008, above $140 before it began to slide again. Travelers began the 2005 summer season with $2.10-per-gallon gasoline, which seemed low a few months later, when Hurricane Katrina pushed prices to more than $3.00. This, in turn, seemed a bargain when economic instability and the unresolved war in Iraq pushed the price to more than $4.00 per gallon. Clearly we live in volatile times, energy-wise. Although oil is still cheaper than harnessing most alternative forms of energy, like the sun and wind, the reality of cheap oil has started to lose its footing. This is not simply due to supplies and cost. The major cause of accelerated climate change, something we have observed for many decades, has become indisputable among scientists: fossil-fuel burning by humans. This leaves ordinary people and policymakers to ask how the consumer-driven way of life can scale itself back. Many factors, from economic predictions to political tensions to war, influence oil prices. But one factor is coming into ever-sharper focus: The world’s oil reserves are dipping ever lower, and sometime in the next couple of generations, they won’t be the cheapest and most efficient way to power the majority of society. We have dealt with short-term problems, such as a few unusually cold winters when people burned more petroleum than usual just when oil producers tried to cut their costs. More ominous are the long-term trends. Petroleum, natural gas, and coal are all finite resources. Demand for them is ever rising, particularly as the world population continues to grow, China continues its roller-coaster ride into the first world, and the United States continues to use a quarter of the world’s energy. Political leaders have known about all of these problems for years. And yet, despite the great interest in renewable energy and conservation by ever-increasing numbers of ordinary citizens like you and me, the country seems stuck in a state of anxiety. We have yet to take major action. Gas for our cars now costs more than the inflation-adjusted price of the late 1970s. Even when adjusted for inflation, crude oil in 2008 reached historic highs of $140 per barrel before dropping again to under $100. This volatility stands up to what we experienced in 1979 (when it cost $38 per barrel or roughly $107 in today’s money) or in 1864 ($8 per barrel or about $134 in today’s money). How desperate do we want to be before we look for other ways to power our lives, keep warm, and travel? Ordinary people are starting to ask why we must rely on a supply of oil that will run out in their children’s lifetimes to provide basic needs like heat and hot water. Experts predict that in the next halfcentury, petroleum reserves will reach a point too low to yield a benefit. As we approach that point, petroleum will continue to cost ever more as demand rises and extraction becomes more challenging. The United States relies on several other countries to supply our oil: Canada, Saudi Arabia, Mexico, Nigeria, Venezuela, and a few others that include Kuwait and Iraq, with which we have gone to war. Listening to the evening news can leave the average American feeling helpless about our dependence on foreign countries in unstable areas for that most basic need—fuel. So far I have been talking economics—the supply, demand, and costs of the relatively near future—and making the argument that this instability should convince most of us to change how we plan to us energy in the coming years. There is a much greater reason, of course, for use to change our ways—one that I sometimes hesitate to invoke because it can be tempting to believe only what suits us if we doubt the guesswork of even the smartest scientists. That is, of course, the toll the pace of modern energy use has exacted on the planet. First of all, we are using up ancient stores of energy too fast to show much consideration for the coming centuries. More important, the burning of fossil fuels is linked with the quickening trend of global warming. The Earth has gone through warming and cooling periods in its very, very long history, most of which doesn’t involve us. But in the last century, a warming trend has accelerated dramatically. It is now an indisputable fact that this accelerated rise in the average yearly temperature on Earth over the past century is the result of humans releasing large amounts of carbon dioxide and other greenhouse gases into the atmosphere by burning oil, coal, and natural gas. Most of North America’s electricity generation, home heating, and transportation rely on fossil fuels. Until we use and develop alternatives, we will continue to feed our precious resources into the hopper of unnatural, human-caused, accelerated warming. Have you ever felt like pulling away from this dependence on fossil fuels? I have, and yet when I started considering this a few years ago, I realized I didn’t know the first thing about how to do it. I was, and largely remain, an average East Coast dweller burning up fossil fuel in my car and in my house and applauding, from afar, off-grid handymen and people rich enough to buy two banks of solar panels. I’m changing, but I have learned that such change comes incrementally. My husband, our two daughters, and I are neither handymen nor wealthy. We live in a 1,100-square-foot Victorian house in a tiny Connecticut town. My family considers itself frugal and environmentally conscious. We keep the thermostat low, turn it down at night, and turn off the lights when we go to sleep. We aren’t big television watchers. We have one home computer and no microwave. We cook from scratch on a propane stove and use a water-saving shower nozzle. Needless to say, I felt irritated and powerless when utility deregulation and supply shortages started to affect my region of the country a few years ago, and I started to pay closer attention to our electric bills. One of our bills for one month, between mid-January and mid-February 2005, came to $216.37 for 1,694 kilowatt-hours of power. (Including all of the transmission and distribution surcharges in my state, the rate at that time was almost 13 cents per kilowatt-hour. Since then it has risen to almost 19 cents per kilowatt-hour.) In southern New England, nuclear and oilburning plants still provide much of the electricity. But this story of rising power demand and uncertain energy supplies is playing out in varying ways across the country. My family’s skyrocketing bills—roughly twice what we had paid only five years earlier—forced me to consider our electricity and where it comes from. I quickly learned that we were paying not only much more than we had budgeted, but that we were using almost twice as much electricity as the average household in our state, even though we have a small house and don’t heat with electricity. (We heat with an oil-burning furnace.) It was a puzzle to us, but it appeared that our electric hot water heater was the main culprit. The same month, I talked to Ed Witkin, who at the time lived west of me in Bridgewater, Connecticut, with his wife, Ellen Shrader, and their two daughters. Their modern house ran almost entirely on solar energy. They were not connected to the electric grid; no wires extended up their long driveway from the street to their house. Forced by their own choice to be careful with power, they had settled into a routine of using no more than 150 kilowatt-hours a month. The Witkin-Shrader family was the same size as ours—two adults and two teenage daughters—and the house itself was larger than ours. They were using one-tenth of what we were in the winter (which is our highest use time because we don’t have air-conditioning). They weren’t sitting in the dark, washing in frigid water, or cooking on an open fire. Like my family they owned one computer and did without a microwave. Their daughters took long, hot showers just as ours did, they had a propane kitchen stove similar to ours, and they, too, watched little television. Here is where they differed from us: Their refrigerator (a Sun Frost) was an ultra-low-energy brand, while ours was not; they heated water with solar collectors on their roof, while we heated our water with electricity; they used compact fluorescent bulbs in all of their fixtures, while we had only two in our house. My family was using more than ten times the energy they were. This realization that I wasn’t the au naturel, environmentally conscious woman I’d envisioned made me feel like a guest on Candid Camera, in which I’d first told some stranger on the street that I probably used less electricity than everyone I knew, only to find that I was a bad statistic. What was up? We, like most Americans, were hooked on a way of life that used too much energy. We might not be wasteful people by nature, but we were going about our business without the feeling that we should turn things off. We didn’t consider it an emergency to replace our ten-year-old refrigerator. We thought that someday we’d get around to replacing the bulbs. We sometimes forgot to turn off lights and appliances. The Witkin-Shraders paid attention to everything, because they were collecting their own energy at their house and didn’t want to run out. We, on the other hand, knew that more energy would always be there for us, as long as we were willing to pay for it. My husband and I had to face up to the fact that we were not doing enough by living in a small house and holding onto old appliances like our vintage 1993 refrigerator, which used four times the energy of many available new models. Our top-loading washing machine was even older, but because it still operated, we didn’t want to discard it even though it used far more power and water than the new front-loading tumble washers. energy consumption. At a grassroots level all of us can begin to change the world by refusing to depend solely on distant sources of fossil fuels. It makes sense morally, financially, and, most of all, environmentally. How do we do it? Making the move to using less energy isn’t an easy choice in financial terms, for us and for most middle-class people. But I’m pleased to say that my family has made major changes in just a few years, and yours can too. One year we bought a new refrigerator, the lowest-energy Maytag I could find. The next year we replaced the washer with a tumblestyle Frigidaire. Both were a little more expensive than what we were used to, but we immediately saw the savings in our electric bills. We replaced most of the lightbulbs in the house with compact-fluorescent bulbs. We are reducing our fossil-fuel usage step-by-step. We didn’t want to just sit back and wait for the large utilities to start using solar or wind power and thus make changes for us. (In fact our state, like many states, has added surcharges that enable it to put money into renewable sources, which means that officials are starting to help us move toward renewables, no matter how slowly that transition might be.) We took action ourselves. So what happened to our energy use? We’ve done okay in three years. The electric bill covering the period from mid-January to mid-February 2008 was $191.65 for 1,071 kilowatthours. That month we owed roughly 11.5 percent less than for the same month in 2005, even though the rate (including the delivery surcharges) had increased by more than 38 percent. More important was our reduction in energy use by almost 37 percent. We have yet to replace our hot-water heater, so I know that we can improve on our record so far. So far most of our changes have been to conserve energy. But what about installing equipment to gather energy from the sun, wind, a stream, or underground? These technologies are now available to home and apartment dwellers. How quickly can consumers recoup investments in alternative energy sources? My family is starting to consider these technologies as they enter the realm of affordability. Don’t wait for alternative energy to become mainstream.Take steps as an individual now and create the demand for alternative energy that assures it will become mainstream. Whether you live alone or with others, in the city, the suburbs, or the country, you can take steps toward independence immediately. We use more power than necessary. We must stop looking at alternative energy as deficient because it could never provide enough energy to directly substitute for oil. Yes, we can use alternative energy sources instead of oil, but we also have to commit to using less energy overall. You can save money in the long term by spending money in the short term. Begin by using less energy as my family and I did—by changing your behavior and changing, little by little, your appliances and sources of heat and light (see chapters 9 and 10). Next, experiment with the two most viable and affordable alternative energy sources: solar panels or solar-thermal systems, and wind generators, which I discuss in chapters 2 and 3. Consider these fuels, developing technologies, and strategies, which I cover in chapters 4 through 9: geothermal heat pumps, biodiesel fuel, fuel cells, wood, micro-hydroelectric systems, alternative cars, and alternatives to driving. The most important thing you can do, however, is this: Use less energy—an act you can accomplish quickly and that’s necessary when using most alternative energy sources. While conservation has yet to catch on as a habit in the United States, we must learn to conserve energy in a time when energy companies are venturing into deeper and more complicated places to find oil, natural gas, and coal, and when worry in the marketplace has made prices of basic energy so high that it will disrupt our daily lives from here on out. It’s the most basic and important act we can perform. I have realized that the best way to conserve energy is to force ourselves into crisis mode. This means believing, as our parents did during hard times, that every car trip, every twirl of the thermostat, every push of the light switch, every decision to buy an appliance, every choice about home-improvement projects, connects not to some do-gooder mentality per se, but to crucial necessity to reduce energy use. We must learn to think of conservation as our response to a crisis that the country has been slow to accept and even slower to act on. It’s not hard to conserve, but it means we have to go against the grain of our friends and family and start thinking differently. High on my list, now that we have a lower-energy refrigerator and washer and use compact fluorescents, is to limit my use of hot water by taking shorter showers and not leaving the water running while I rinse dishes, to explore trimming the tops of a few critical trees to install a solar hot-water system on our roof, to replace my old Ford Taurus with a used Volkswagen Golf (combining low cost with fairly high gas mileage) or, perhaps, even a hybrid, and to drive fewer miles. As Thomas L. Friedman, columnist for the New York Times, said in a speech at Brown University in 2008, it doesn’t really matter whether we reduce energy use because of climate change or because of dwindling world supplies. What matters is that we reduce energy use. Just a few years ago, those most likely to aggressively conserve energy were those who viewed it as a matter of environmental ethics. Now the ethics of saving energy is beginning to converge with the economics of doing so. In a sense I couldn’t be happier that my friends and acquaintances are talking about climate change and energy prices, because I can see that everyone is starting to care. It might sound a little cynical to look at things as Friedman does, but I daresay he’s right: What matters is that we reduce energy use, period. We, the people, can force the issue, and we can do this now. I was sitting at my desk one day in 2005, no doubt worrying about the next assignment, when the phone rang. Or did the email silently slip into the In box? It was Holly Rubino, an editor at Lyons Press, a division of Globe-Pequot Press in Guilford, Connecticut. One of her colleagues was looking for a writer to dig into how ordinary Americans could use less fossil fuel, a writer who was intrigued with the details of clothes dryers and hot-water bills and the per-capita energy use in California as compared to the rest of the United States. I love that sort of thing. Here is how I knew Holly Rubino. Her mother is the town clerk of Lyme, Connecticut, part of my newspaper beat for seven years. Her mother gave me ideas for short stories, inspired me to work harder, asked about my daughters, and remembered me. This is how projects are born. 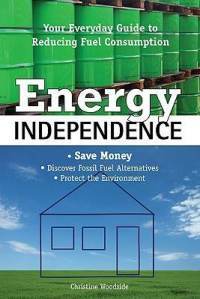 To buy Energy Independence from Barnes and Noble, click here. To buy it from Amazon, go here. Or Powell’s Books, here. Petroleum rules, and coal is tied with natural gas for second place. All three have accelerated world climate change. Starting roughly forty years from now, something must take their place. From President Carter’s solar panels on the White House roof to NASA’s newest solar panels, the technology for harnessing the sun has dramatically improved. A look at how they work, how to start small, the estimated costs (both financial and environmental), and the amount of time it takes to recoup your investment. What are wind generators and how do they work? A primer on wind power on a large scale. How to start small, how to deal with the neighbors, products, and costs, and the amount of time it takes to recoup your investment. While the predictions of a hydrogen economy still resemble a science-fiction story, fuel cells have made some progress. How do they work, and where can you buy one? Biodiesel fuel for cars or furnaces (primarily vegetable oil) has become an industry. Geothermal systems tap into a constant natural temperature below the ground. The oldest heat source remains a good choice for alternative energy in many areas. A look at using wood as a backup without polluting, using scrap wood and wood pellets, wood furnaces, and the costs and impact on the air. The first hydroelectric dam went up in Egypt thousands of years ago. New Englanders started running machines off water power 350 years ago and promptly wiped out some fish populations. Now that many of the old small dams are gone, we are looking at the power of water on a small scale again. This time you must cooperate with the fish. Who can use a micro-hydro system? Gas-electric hybrid cars, plug-in electric cars, and hydrogen vehicles: Will these technologies ever work well enough to dominate? A look at alternative cars, specific models and costs (financial and environmental), the length of time it takes to recoup your investment, and a comparison between a standard hybrid and a similar traditional car. Conservation as a philosophy. A brief history. Ways in which efficiency has become mainstream: housing insulation, cleaner gasoline, high-gas-mileage cars. A list of effective actions to cut back on energy consumption: restraint, choosing efficient appliances, insulating walls, changing lightbulbs, exploring new behavior at home and in the car, and taking a tough survey of your total energy use. A call for every citizen to discard energy hogs. Determine which appliances are extraneous in your life: the free-standing freezer you forgot about? the microwave oven? the hair dryer? Scrutinize it all. You have nothing to lose but your kilowatt hours.